It's so hard getting used to the new winter hours. When we arrived at The Tavern on Main in Chepachet, RI, it was only 3:30 p.m. but already getting dark. The cold and dreary weather didn't help either. I guess summer really is gone. No matter. We were here now and ready for a terrific meal. The Tavern on Main is one of our favorite restaurants. It's dark, cozy, and very old with many of its original furnishings. It was built in the early 1700's and was used as an inn and old stagecoach stop. On their website (above), you can find out all about their unique political history. Plus, you can learn about the resident ghosts ... yes ... ghosts. 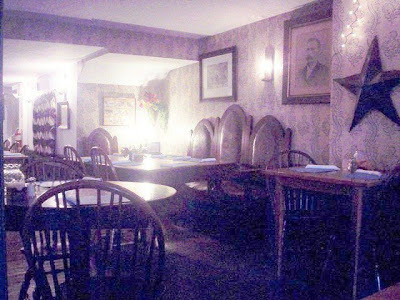 Check out our previous review here and take a look at the ghost video and the spooky orbs in our photos. Historical ambiance aside, we really come here for the comfort food. Seafood, beef, veal, chicken, and Italian dishes are all represented here. They also have some unique appetizers like clams casino and Parisian mussels plus dinner salads and French onion soup. Their comfort corner includes gourmet mac and cheese, steak loaf, Yankee pot roast, shepherd's pie, and various pastas. Their complete menu is listed on their website. Something unique to The Tavern on Main is their soup station. Help yourself to all the soup, crackers, bread, and spreads that you wish. The soups change daily (today's was Italian wedding). We've had several kinds and they've all been good. This is such a nice service. Plus, most meals come with a salad and your choice of a homemade dressing. Try the peppercorn - it's amazing. On this visit Laura pulled herself away from her favorite pecan encrusted chicken to try the pumpkin seed crusted chicken breast over pumpkin-filled ravioli in a pumpkin-sage sauce ($17). It smelled like she was eating pumpkin pie and when she gave me a bite, it tasted like it. This was absolutely delicious and I was immediately jealous. She was delighted with her choice. 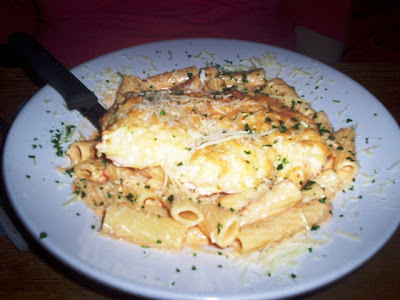 I decided to try one of their most requested dishes, the Parmesan encrusted chicken over rigatoni in a pink vodka sauce ($16). This was my first time with this dish but it won't be my last. It was fantastic and I can see why it's "most requested." I let Laura have a taste and she agreed. As you can see by our plates, The Tavern on Main is very generous with their servings. Factor that in with the soup and bread station and the salads and you know why I always end up bringing home some Styrofoam. We love coming here. The food, service, and atmosphere can't be beat. We usually make it here for a late lunch but if you plan on coming after 4 p.m., I'd suggest you make reservations. They fill up quickly. Make sure you check out their website for days and hours because they're not open everyday nor open for lunch on some days. You might even want to call first, just to make sure. A plus ... the ride out to Chepachet is a lovely winding country road ending in an adorable little village complete with antique shops. 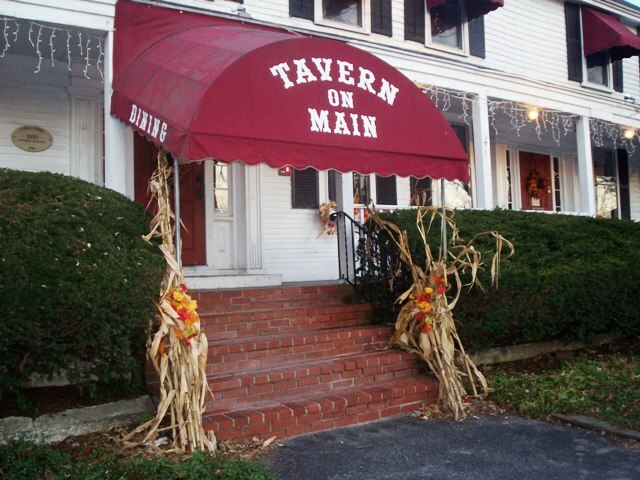 Get yourself to The Tavern on Main for some amazing food in a comforting setting. Oh, and tell the ghost I said hi! 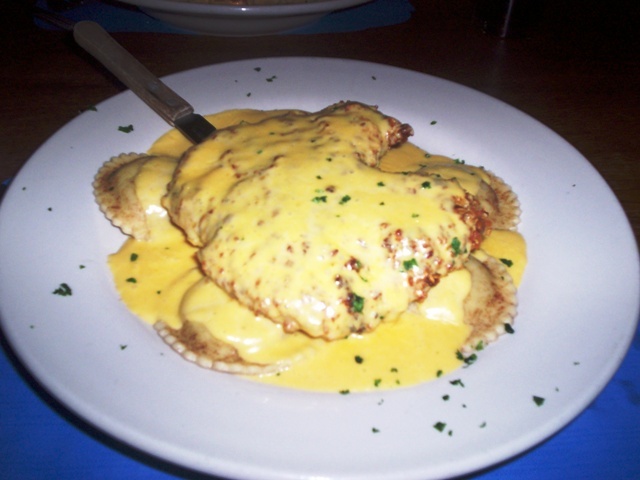 Don't forget to check out MenuJoy.com for some great area restaurant menus.